SápmiToo is conceived and organised by Dáiddadállu with the support and collaboration of the Office for Contemporary Art Norway and the Sámediggi of Norway. Best of Norway – from Dáiddadállu! 24 designers in Norway are hand-picked for the international design week in Milan to represent the best of Norwegian design. As we speak, Salone del Milan, The international Milan design week 2019 is happening. 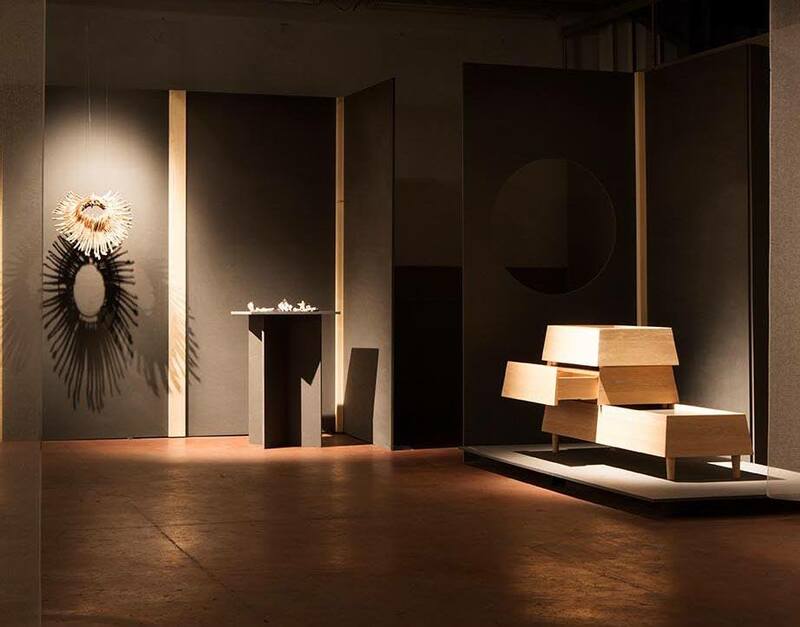 The exhibition Join -Norwegian Presence in Via Savona 35, is curated by the acclaimed creative studio Kråkvik&D’Orazio and is a collaboration between Design and Architecture Norway (DOGA), Klubben and Norwegian Crafts. Among the four best crafts artists in Norway today, we find Dáiddadállu´s Máret Anne Sara and her collaborator Matt Lambert. 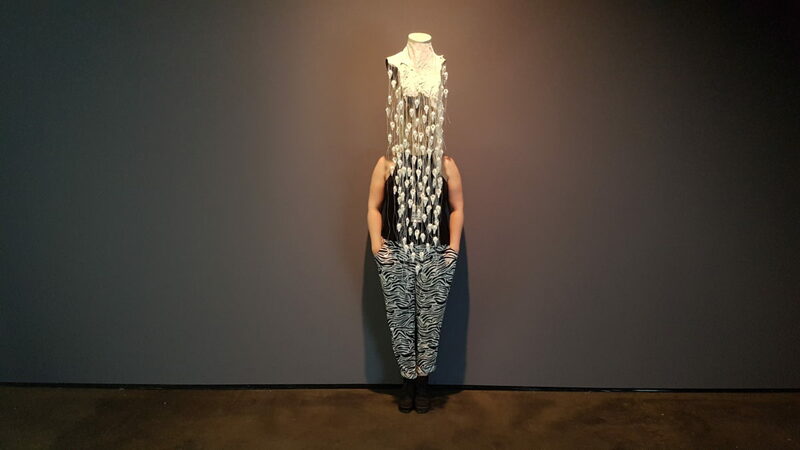 Sara and Lambert exhibit their art-jewelery project “Pile Power”, which consists of porcelain made of reindeer bones, and the work “Loaded – Keep hitting our jaws” which the artist duo made right here at Dáiddadállu a year ago. Pile Power is a new, elaborative section of Máret Ánne Saras bigger body of work Pile o´Sápmi which aims to debate new colonial oppression through laws and politics in Norway, and the extended global community. 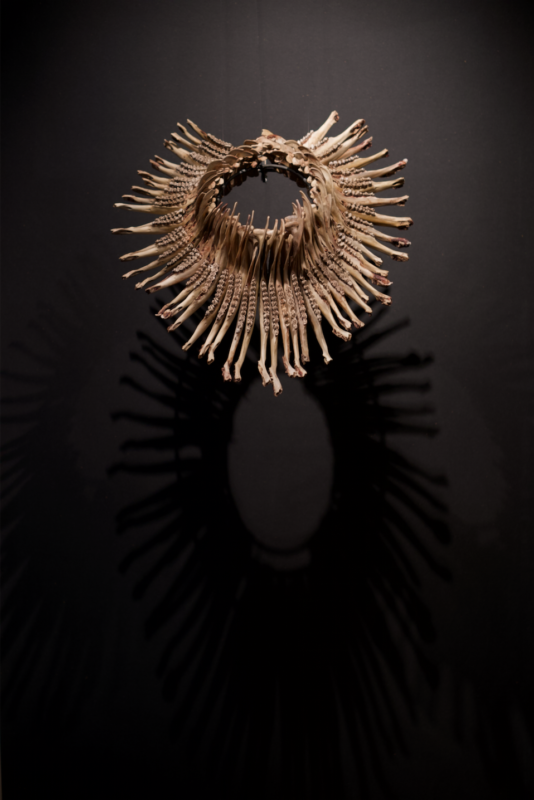 The Pile Power art-jewlery project is based on the reuse of the surplus material from Saras Pile O’Sápmi installations. 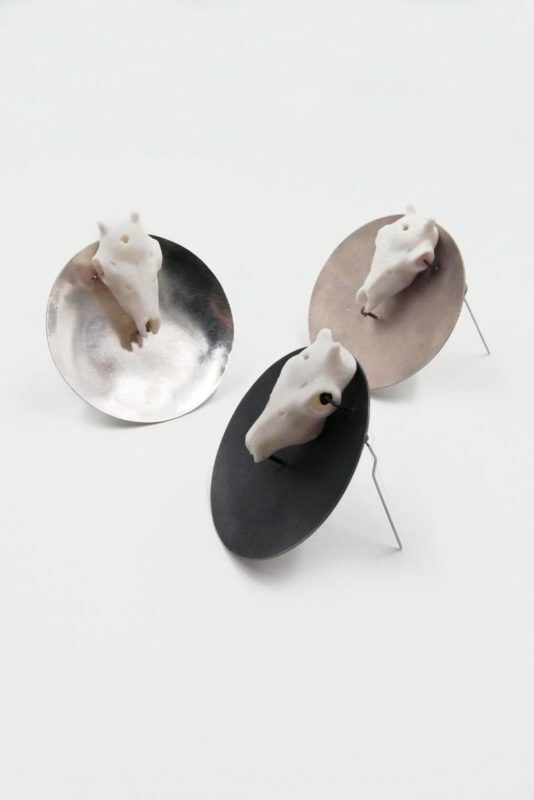 Meaning, new works made of reindeer jaws and reindeer bone-porcelain. 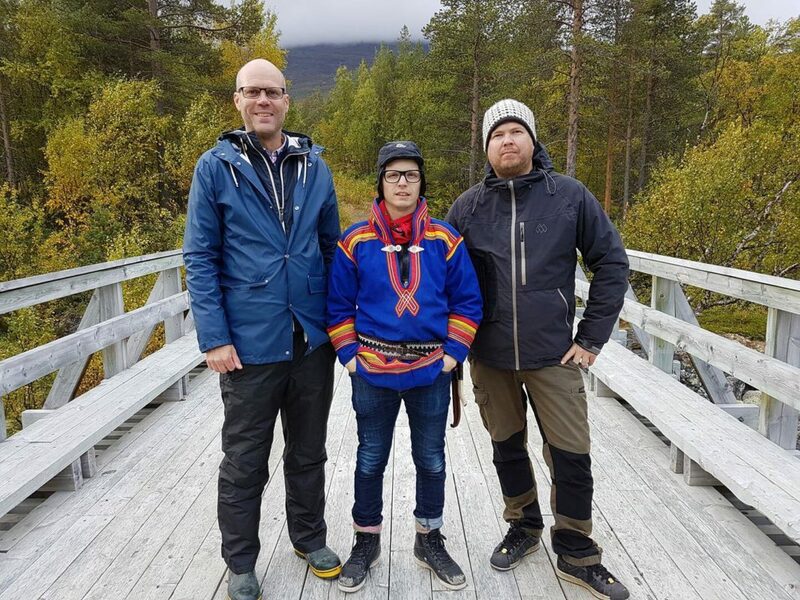 The project marks support for Sara´s younger brother Jovsset Ante Sara, in the fight against the Norwegian state regarding the forced slaughter of reindeer – hence the right to live as a Sami reindeer herder on the indigenous Sámi land. 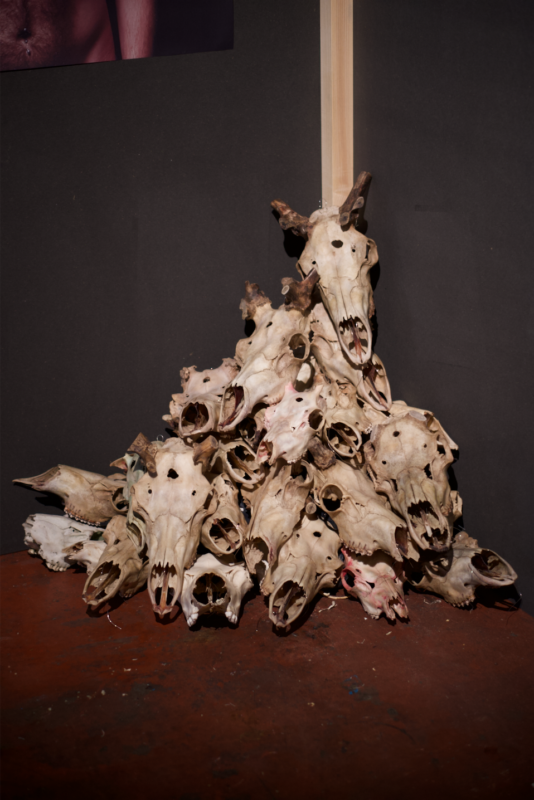 Sara invited Lambert to enter a dialogue with the intent for finding methods to use all available material that was remaining from her earlier pieces consisting of more than 400 bullet ridden reindeer heads, as shown in Documenta 14. 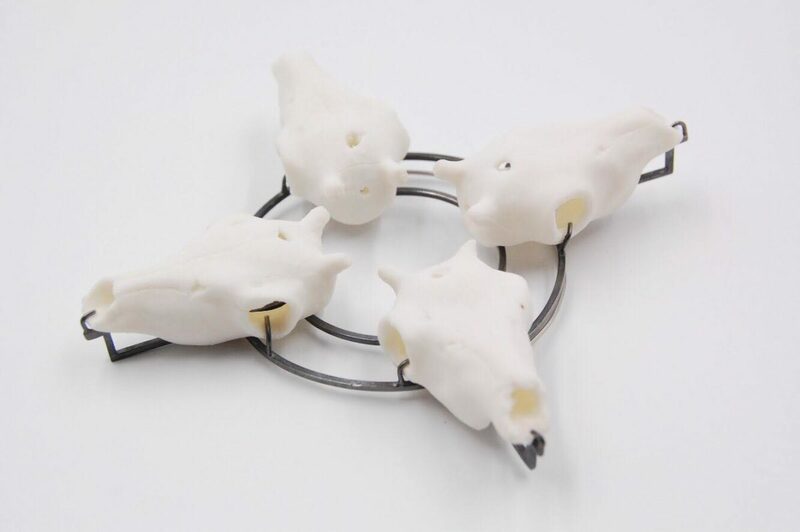 This collaboration is producing larger performative objects using the remaining jaws of the reindeer skulls, as well as more wearable works from the remaining reindeer-porcelain skulls from the Pile O’ Sápmi Powernecklace. Both of these veins of working promote the conversation around sustainable practices, rights and exitstense of indigenous peoples. In Pile Power, body and material form a new basis for approach for themes addressed in the Pile O´ Sápmi project. Sara and Lambert met as invited speakers during Munich Jewelry Week 2018. Sara invited Lambert to collaborate after finding a connection through a conviction for socio-cultural sustainability as well as minority comradery between indigeneity and queerness. 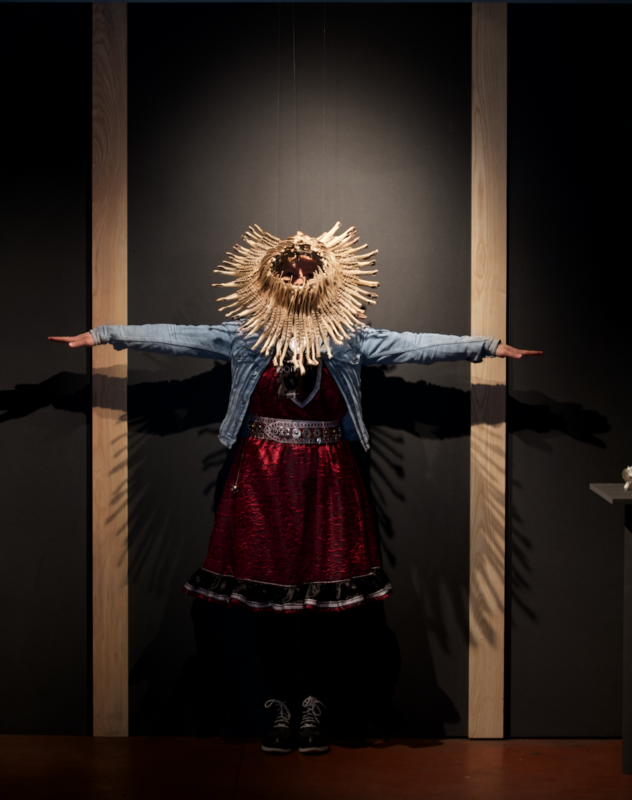 While in residency with Praksis supported by Norwegian Craft focusing on gender and adornment, Lambert traveled to Guovdageaidnu (Kautokeino) to experience a sense of physical place, to share cultural histories and to initiate a collaborative making process which remain ongoing. Lambert is currently a masters candidate in critical and historical craft theory focusing on underrepresented groups including indigenous peoples. 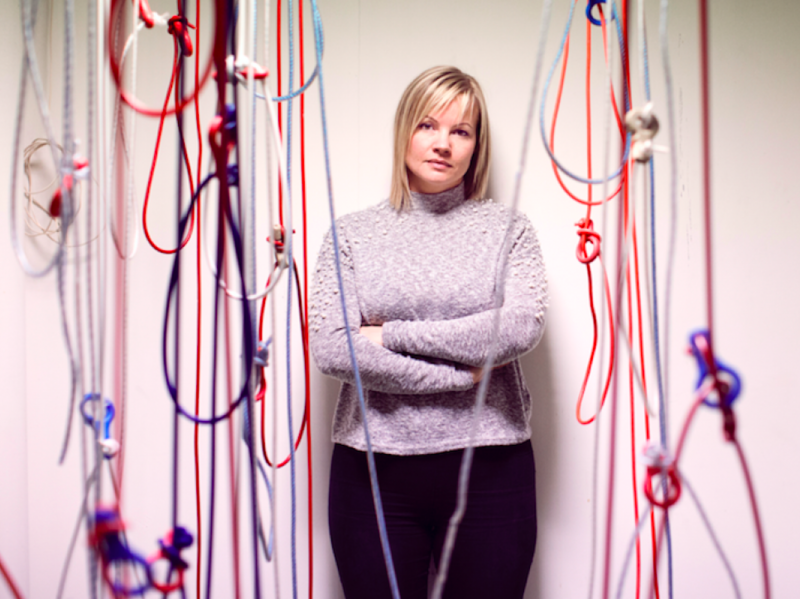 This collaboration has also sparked Lamberts inclusion of continued research with Sami and indigenous forms of making in a thesis research project being undertaken at Warren Wilson College in the U.S in Critical and Historical Craft. The motivation behind this project is to continue the ongoing discussion of sustainability of indigenous practice and livelihoods, and how these conversations transgress perceived geographical lines as well as cultural boundaries. Sara and Lambert have initiated a dialogue about finding connection through means that go beyond westernized conception. Based on creative dialogue, a thematic jewlery collection will nomadically carry a new segment of an urgent discourse through bodies and humans. 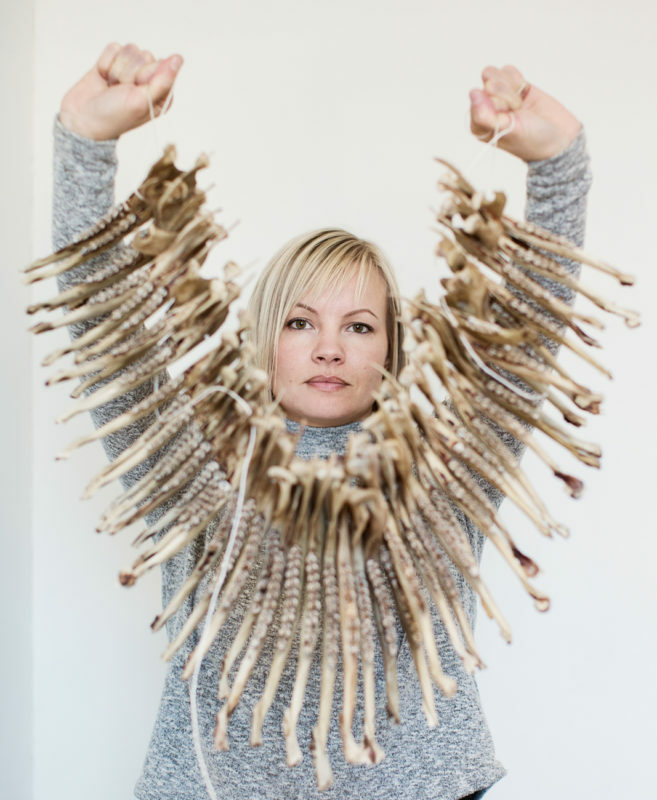 Saras first Pile o´Sápmi piece was an installation of 200 raw reindeer heads, installed outside Inner Finnmark District Court in February 2016, as her younger brother Jovsset Ante Sara brought a case against the Norwegian government and the implemented forced culling of reindeer. In his case a culling to 75 remaining reindeer, which means bankruptcy and the loss of rights, culture and livelihood. 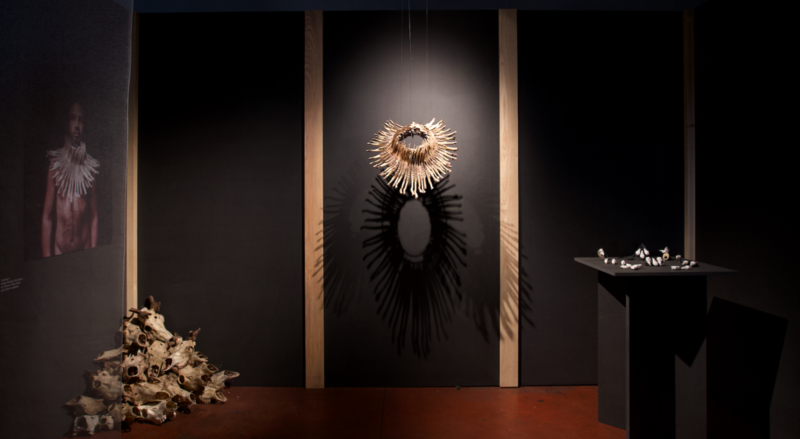 The piece is a sociopolitical reference to Pile o´ bones, 19th century North America where authorities sanctioned buffalo massacres as a tactical means to remove indigenous peoples from their lands and thereby gain access to their territories. Jovsset Ante Sara´s case against the Norwegian government is set to prevent forced slaughter of his reindeer herd and to defend his right to practice his culture and traditional way of life. Máret Anne Sara has artistically been tracking her brothers case through the legal system of Norway, where Sara won twice on the grounds of human rights and indigenous rights, but ultimately lost at the Norwegian Supreme Court. The case sets an important precedent in terms of indigenous rights in Norway and has been sent to the UN commission on human rights. Sara´s situation and livelihood is uncertain as the Norwegian authorities refuse to await the UN. Forced slaughter of Sara´s reindeer herd has been set to be due before september 2019, while Sara suddenly also has been fined over 640 000 Norwegian kroners during the legal process. Pile o´Sápmi aims to raise awareness and carry debate through creative practices, dialogues and productions. 20:30 – 21:30 Artist talk Kill a Cat Show, LES-bygget. Info om Kill A Cat Show trykk her! 16.00 – 17.00 Ráhppán SápmiToo čájáhus// Re-åpning av SápmiToo utstillingen, Dáiddadállu. Ànna-Katri Helander sammen med Haka dansere Aniwa og Mika avslutter reåpningen. Info om SápmiToo utstillingen og åpningen trykk her! Info om filmen “Giitu Giitu” trykk her! SápmiToo lea deaivvadeapmi gos dáidda ja ságastallan lea guovddážis. Mii ságastallat sohkabealrollaid, veahkaválddálašvuođa ja seksuála illásteami birra ja mo dáidagiin sáhttá čuvget dáid fáttáid. Prográmmas leat sáhkavuorut, ságastallan ja digaštallamat, ja maiddái dáiddalaš ovdanbuktimat, filmmat, musihkka ja čájáhus. Ollislaš prográmma almmuhuvvo facebook siiddus, čuovo mielde! 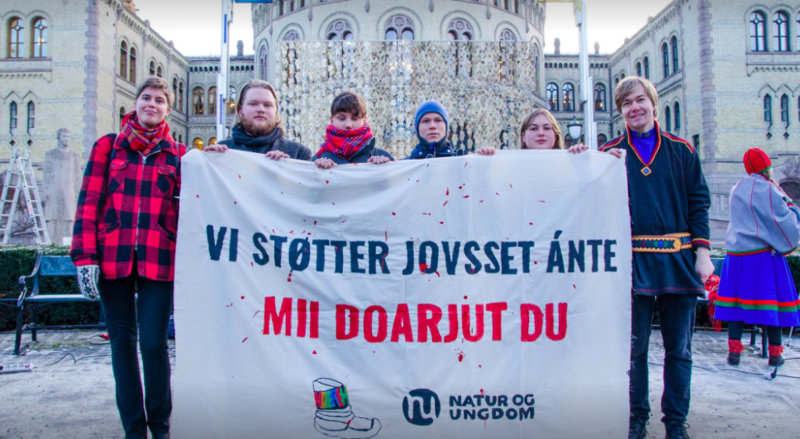 Dáiddárat geat servet deaivvadeapmái leat earret eará Wanda Nanibush (son lea álggahan Idle no more lihkadusa), Hilde Skancke Pederesen, Jenni Laiti, Máret Anne Sara, Mari Boine, Johan Sara Jr, Susanne Hætta, Anne Merete Gaup, Sara Marielle Gaup Beaska. Sáhkavuorut leat earret eará dáin: Rauna Kuokkanen, Liv Inger Somby, Inga Marja Steinfjell, Lisa M Kristensen. Dáiddadállu lágida SápmiToo ovttas Office of contemporary art Norway (OCA) ja Norgga Samedikkiin. Deaivvadeapmi álgá duorastaga njukčamánu 14.b. diibmu 18:00, ja loahpahuvvo lávvordaga 16.b eahkes. Máksá NOK 650 r. oasálastit, das čuovvu gáffe ja šattut goappaš beivviid ja eahketlágideamit. Lunša ja mállásiid sáhttá oastit dan báikkis gos mii leat. Bearjadaga sáhttá oastit biebmu Diehtosiidda kantinas, ja lávvordaga vuovdá Máze gilisearvi biebmu. Studeantta haddi lea NOK 450 r. Registreremis gáibiduvvo studeantta duođaštus. Dieđihanáigi lea njukčamánnu 6. beaivvi. Jus dieđihat dan maŋŋel dahje boađát seammá beaivvi go deaivvadeapmi álgá, de máksá NOK 1000 r.
Deaivvadeapmi lea nuvttá skuvlaklássaide ja nuoraide 13- 18 jagiin. Oahpaheaddji sáhttá dieđihit iežas luohká liŋkka bokte, ja čállit galle oahppi leat. Eahketdoalut leat Thon hoteallas. Ahkemearri Thona eahketdoaluide lea 18 jagi. Doalut lea Diehtosiiddas njukčamánu bearjadaga 15. b. ja Máze skuvllas lávvordaga 16. b. Mis lea busse, registrerejuvvon oasseváldit sáhttet čuovvut busse. Manná busse Álttás Guovdageidnui duorastaga 14.b. dii. 15:00- 17:15 https://snelandia.no/ Snelandia telefovdna lea 177. SápmiToo ordne busse Guovdageainnus Áltái sotnabeaivve 17. beaivve diibmu 07:30- 09:30 ja diibmu 15:20- 17:20. Jus háliidat busse čuovvut Áltái sotnabeaivvi, de dieđit dieđihan liŋkkas. Prošeaktajođiheaddjit Dáiddadálu bealis leaba Dine Fenger Lynge ja Elle Sofe Sara. 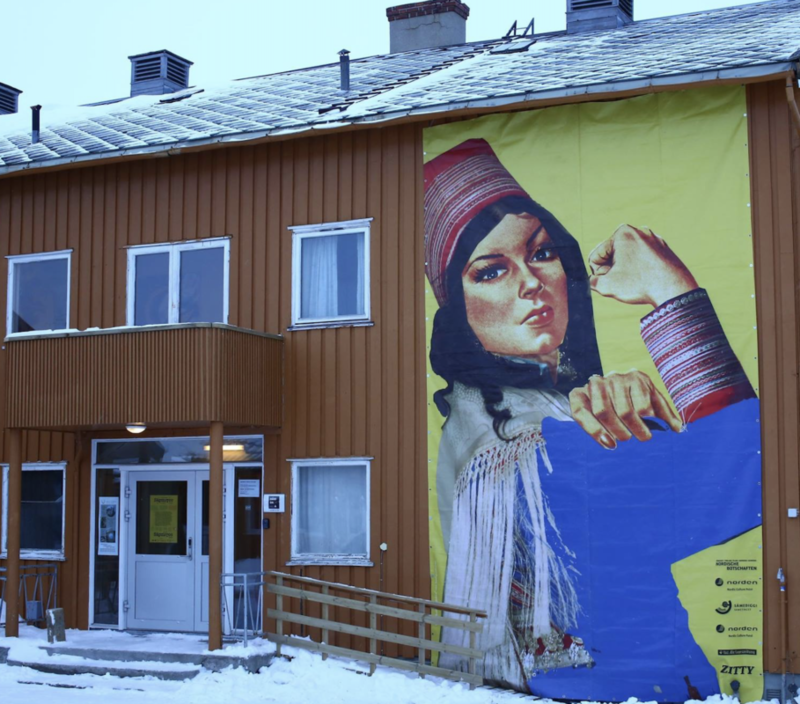 Sápmi Too er et arrangementet hvor kunst og samtaler står sentralt. Vi snakker om kjønnsroller, vold og seksuelle overgrep og hvordan kunst kan belyse disse temaene. Programmet består av innlegg, samtaler og diskusjoner, og kunstneriske innslag, film, musikk og utstilling. Helhetlig program vil publiseres på facebook siden senere, følg med! Medvirkende kunstnere er blant Wanda- Nanibush (hun har startet Idle no more) Hilde Skancke Pedersen, Jenni Laiti, Maret Anne Sara, Mari Boine, Johan Sara Jr, Susanne Hætta, Anne Merete Gaup, Sara Marielle Gaup Beaska m fl. Andre medvirkende er blant annet Rauna Kuokkanen, Liv Inger Somby, Inga Marja Steinfjell, SANKS, Lisa Kristensen m fl. 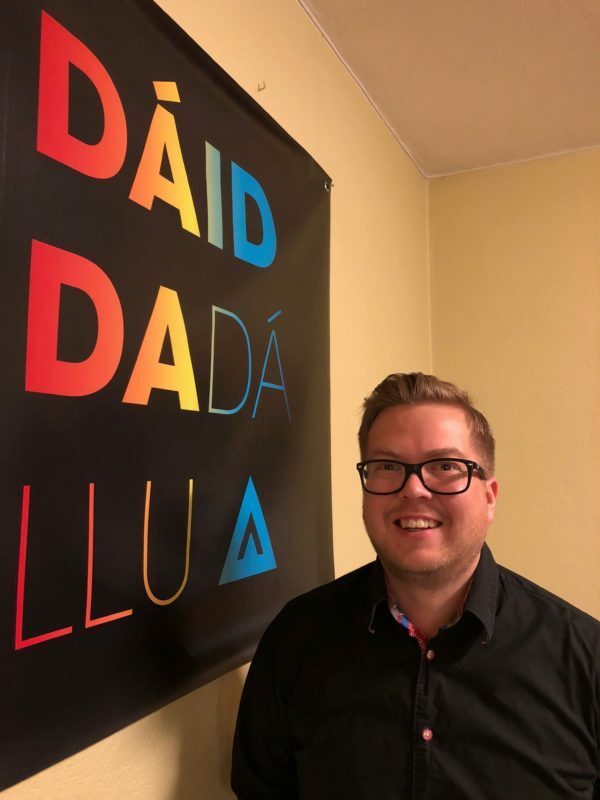 SapmiToo arrangeres av Dáiddadallu/ Artist collective Guovdageaidnu, i samarbeid med Office of contemporary art Norway og Sametinget i Norge. Arrangementet starter torsdag 14.mars kl. 18:00, og avsluttes lørdag kveld 16.mars. Arrangementet skjer på nordsamisk, med simultan tolkning til engelsk. Det koster NOK 650 å delta, dette inkluderer kaffe og snacks begge dagene og inngang til kveldsarrangementene. Lunsj og middag kan kjøpes på stedet. På fredag kan man kjøpe lunsj på kantina i Diehtosiida og på lørdag selger lokal leverandør i Maze lunsj og middag. Student pris NOK 450. I registreringen kreves det dokumentasjon gyldig studentbevis. Påmeldingsfrist er 6.mars. Påmeldinger etter dette eller registrering i døra koster NOK 1000. Arrangementet er gratis for skoleklasser og ungdom mellom 13- 18 år. Lærer skal bruke påmeldingsskjema for å melde inn klassen og antall elever. Kveldsarrangementene på Thon hotell har en aldersgrense på 18 år. Arrangementet er på Diehtosiida fredag 15.mars og i Maze skole lørdag 16.mars. Det går en egen buss mellom disse stedene, som de som har registrert seg kan ta. Det går buss (https://snelandia.no/) fra Alta lufthavn til Kautokeino torsdag 14.mars kl. 15:00- 17:15. Telefon for rutetider er 177. SapmiToo setter opp buss mellom Kautokeino/Maze- Alta flyplass, søndag kl. 07:30- 09:30 og kl.15:20- 17:20. Hvis du trenger skyss til Alta søndag, så meld dette i påmeldings linken. Prosjektledere fra Dáiddadállu er Dine Fenger Lynge og Elle Sofe Sara. 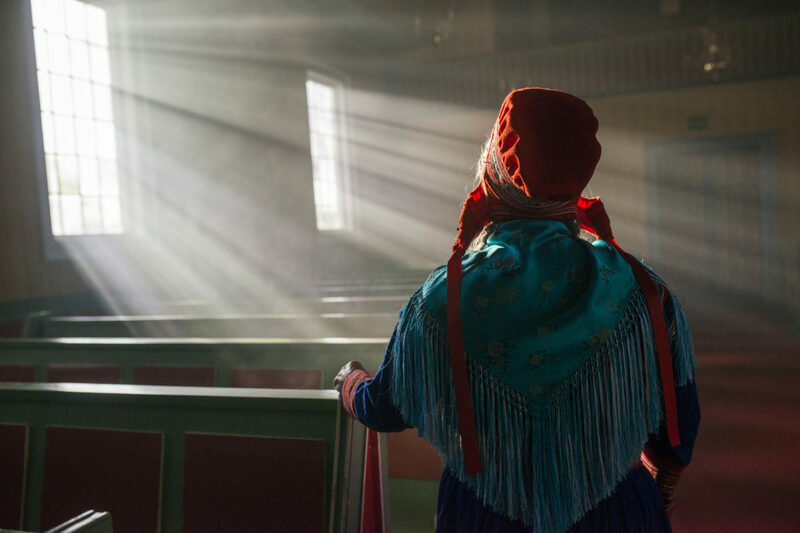 Sápmi Too is an event where art and conversation is central. We talk about gender roles, violence and sexual abuse and how art can shed light on these issues. The program consists of lectures, conversations and discussions, and artistic features such as film, performance, poetry, yoik, music and exhibition. The whole programme will be published later on DD facebook page, stay tuned! Some of the contributing artists are Wanda-Nanibush (she has started Idle no more), Hilde Skancke Pedersen, Jenni Laiti, Maret Anne Sara, Mari Boine, Johan Sara Jr, Susanne Hætta, Anne Merete Gaup, Sara Marielle Gaup Beaska. Other contributors include Rauna Kuokkanen, Liv Inger Somby, Inga Marja Steinfjell, SANKS, Lisa M Kristensen and others. 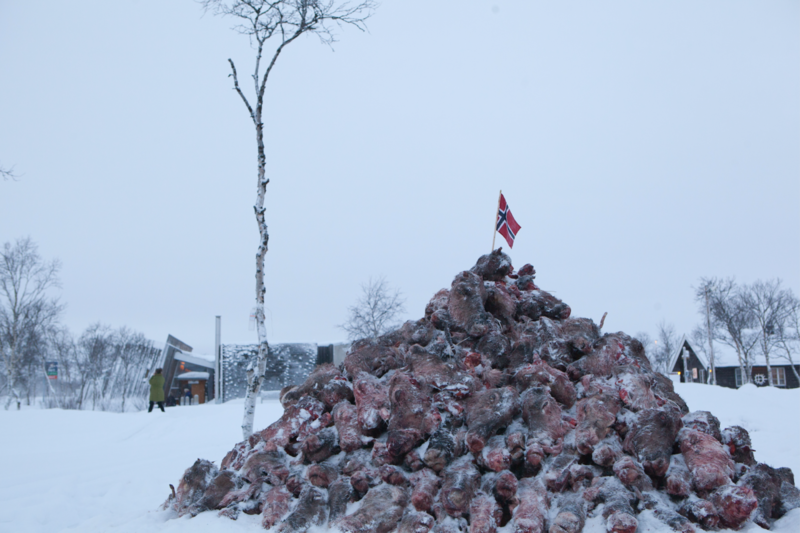 SápmiToo is arranged by Dáiddadállu / Artist collective Guovdageaidnu, in collaboration with Office of contemporary art Norway (OVA) and the Sami Parliament in Norway. The event starts on Thursday, March 14 at. 6pm, and ends on Saturday night March 16. Language: North Sami, with simultaneous interpretation into English. It costs NOK 650 to participate, this includes coffee and snacks both days and entrance to the evening events. Lunch and dinner can be bought on site. On Friday you can buy lunch at the Diehtosiida canteen and on Saturday local people in Máze will sell lunch and dinner. For students the price is NOK 450. The registration requires documentation that you are a student. Registration deadline is 6 March. Registration after this or registration in the door costs NOK 1000. The event is free for school classes and youth between the ages of 13 and 18. Teachers must use the registration form to register the class and the number of students. Evening events at Thon Hotel has an age limit of 18 years. 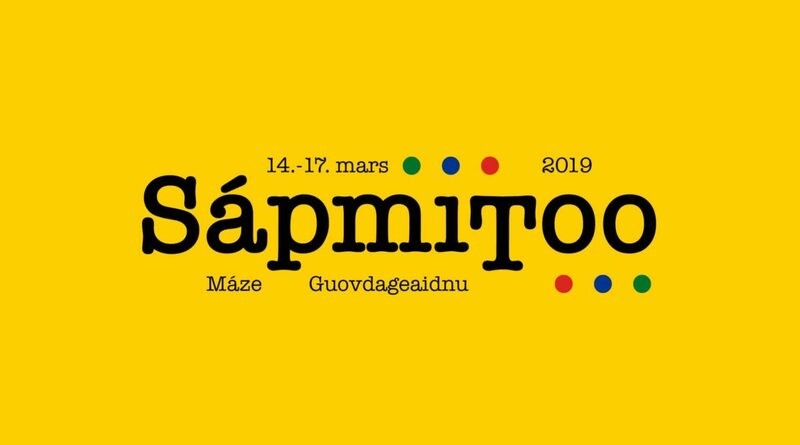 SápmiToo is at Diehtosiida on Friday 15 March and in the Maze school on Saturday 16 March. We have a bus that drives between these places, everyone with a registration pass can use the bus. How to travel to/from Guovdageaidnu? The nearest airport is Alta. Both www.sas.no and www.norwgian.no have flights to Alta airport. SápmiToo has a bus between Kautokeino/ Maze – Alta airport, Sunday at 07:30- 09: 30 and 15:20-17:20. If you need a shuttle to Alta Sunday, please report this in the registration link. Where can I stay in Guovdageaidnu? På Samefolkets dag (6. februar kl 19:00) – sparkes Lounge Sápmi i gang på Kautokeino Kulturhus, som den første pop-up musikkaféen i Kautokeino noensinne. Konseptet er enkelt – én artist/gruppe vil holde en intimkonsert, deretter vil scenen åpnes for andre som vil spille. I tillegg til å være en arena for musikere og musikkinteresserte, så vil vi også involvere andre kunstformer. Det vil bli servert enkel bevertning, som er gratis for de under 18 år. Vi er stolte av å presentere fjorårets Sámi Grand Prix-vinner, sanger og musiker Inger Karoline Gaup, som vår første artist. Hun har siden seieren i Sámi Grand Prix gjort spillejobber rundt omkring i Norge, men også i utlandet, og skal nå holde en intimkonsert på Lounge Sápmi. Bak arrangementet Lounge Sápmi står folk fra musikkmiljøet i Kautokeino, med Anthoni Hætta i spissen, med god hjelp av Lisa Marie Kristensen fra Dáiddadállu og andre samarbeidspartnere fra både musikk-og kunstmiljøet, skoler og næringslivet. Du finner oss på Instagram og Facebook @loungesapmi. Musikalsk pop-up-kafé som arrangeres av og med musikere der musikken står i sentrum. Skal fungere som en møteplass for musikere og musikkinteresserte, men også for dem som bare vil høre på musikk. I hver Lounge Sápmi kommer en artist eller musiker til å spille en intimkonsert for publikum, og deretter er det åpen scene. 6. februar, 19:00, og deretter én gang i måneden. Sámi álbmotbeaivvi – guovvamánu 6. beaivvi lágiduvvo vuosttaš musihkalaš pop-up kafea Guovdageainnus, namalassii Lounge Sápmi. Konseapta lea álki; okta artista/joavku čuojaha lagaskonseartta, ja dan maŋŋel lea lávdi rabas sihke šaddi, nuorra ja eallilan musihkkáriida, geat háliidit čuojahit fárrolaga dahje okto. Dasa lassin ožžot eará dáiddasuorggit maid vejolašvuođa čájehit doaimmaideaset. Mis lea eaŋkilis guossoheapmi, mii lea nuvttá gussiide vuollel 18 jagi. Mii leat rámis go beassat almmuhit ahte diimmá Sámi Grand Prix vuoiti, Inger Karoline Gaup, galgá čuojahit vuosttaš Lounge Sámis. Dan rájes go vuittii Sámi Grand Prixas lea Inger Karoline mátkkoštan miehtá Norggas ja muđui máilmmis, ja dál galgáge doallat lagaskonseartta Lounge Sámis. Lounge Sápmi-doalut lágiduvvojit návccaiguin Guovdageainnu musihkkabirrasis. Njunužis lea musihkar Anthoni Hætta ovttas Dáiddadálu Lisa Marie Kristensenain, oktan ovttasbargoguimmiiguin sihke musihkka- ja dáiddabirrasis, skuvllain ja ealáhusas. Gávnnat min sihke Facebookas ja Instagrammas @loungesapmi. Musihkalaš pop-up kafea mii lágiduvvo musihkkariiguin ja čuojaheddjiiguin, gos musihkka lea guovddážis. Lounge Sápmi galgá leat deaivvadanbáiki musihkkariidda ja musihkkaberošteddjiide, muhto maid sidjiide geat dušše háliidit guldalit musihka. Juohke Lounge Sámis boahtá leat artista dehe musihkar gii čuojaha lagaskonseartta ja dan maŋŋil leages rabas lávdi. Guovvamánu 6. beaivve, dii. 19:00, ja dasto okte mánus. Sisabeassan lea nuvttá. Eaŋkilis guossoheapmi. Lounge Sámis ii beasa návddašit alkohola. Dáiddadállu medlemmer med premierer under årets TIFF!! 4 av Daiddadallus filmskapere er nominert til Tromsø palmen under årets filmfestival! Filmen “Giitu Giitu” laget av grunnleggeren av Dáiddadállu Elle Sofe Sara. Og med fra DD har hun med Anitta Katariina Suikkari og Rawdna Carita Eira som skuespillere. “Samene har rett” er triologi om Norges skam hvor filmskaperne forteller sannheten og deres daglige kamp mot det som til stadig ødelegger for reindriftsnæringen. Filmen er laget DD medlemmene Ken Are Bongo, Elle Marja Eira, Mai-Lis Eira. I tillegg så er to av Dáiddadállus skuespillere Ingá Márjá Sarre og Anja Saiva Bongo Bjørnstad med i kortfilmen “Guolleságat” av Egil Pedersen. “Giitu Giitu” og “Samene har rett” har første visning imorgen 17 januar 20.30. Dáiddadállu ønsker sine medlemmer lykke til med premierene og ønsker publikum vel møtt for å se hva våre flinke kunstnere skaper i Kautokeino. Det storslåtte Pile O´Sápmi verket lever i beste velgående og oppstår – og utbroderes – i stadig nye retninger. Beinrester fra de mye omtalte reinhodene til kunstneren Maret Anne Sara, danner nå grunnlaget for en ny og konseptuell smykkekolleksjon. Sara har invitert inn smykkekunstneren Matt Lambert til prosjektet og sammen lanserer de kolleksjonen “Pile Power” førstkommende torsdag den 10 januar, ved Kunstnerforbundet i Oslo. – Jeg er veldig glad for at Matt ble med på prosjektet. Matt er en spennende kunstner og en herlig person som jeg møtte under smykkeuken i München i fjor der vi begge var invitert inn av Norwegian Crafts for å presentere våre kunstnerskap. Jeg fikk et lite glimt av arbeidet hans og ble veldig tiltrukket av estetikken og det utradisjonelle i hans kreasjoner. Matt er en unik kunstner som markerer seg innen smykkekunstens verden og evner balansen mellom å appelere samtidig som han utfordrer. Vi fant en felles plattform i tanker og engasjement utifra et minoritets ståsted som queer og indigenous. Det ligger mye felles i våre grunnleggende livserfaringer, kampen rundt eksistens og et tankesett som ikke nødvendigvis passer i den vestlige “normalen”. Jeg føler at vi blir sterkere sammen, og at våre stemmer behøvde å møtes mellom Detroit og Guovdageaidnu for å tas videre til verden. – For meg betyr denne kolleksjonen svært mye. Først og fremst på grunn av materialet som jeg personlig har levd med og arbeidet intenst med i så mange år. Det er et enormt arbeid som ligger i dette materialet, en enorm sorg og redsel, en vanvittig kjærlighet og stolthet. 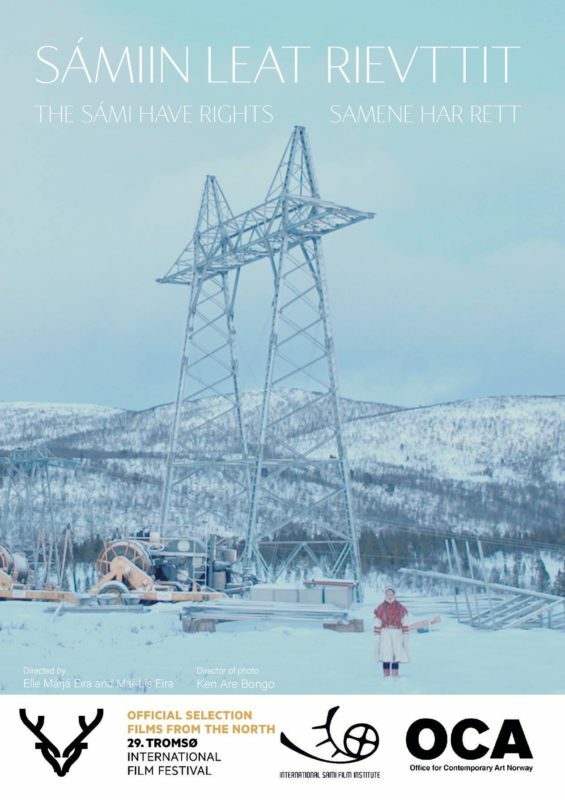 Deretter et sinnsykt engasjement fra Sápmi og verden, som materialet bærer energien av. Alt ved disse hodene, disse kjevene, disse beinrestene, betyr så mye både politisk, personlig, historisk, kulturelt, sjelelig, menneskelig og åndelig. Materialet er så rikt og så ladet. Det bærer en så omfattende diskurs i seg selv. Videre er smykkekolleksjonen en underbetont diskurs om ressursbruk og ressursforvaltning, og et slag for solidaritet og rettigheter, sier Sara, om det nye prosjektet der kunst møter kropp og fører en nomadisk diskurs i direkte kontakt og relasjon med mennesker. – Det er enormt spennende å snuble over i nye baner, sier Sara. Ved ny baner, mener hun smykkekunst. – Smykker er helt nytt for meg. Det begynte med at jeg ville jobbe videre med beinrestene jeg satt igjen med etter å ha slaktet og kokt bortimot 500 reinhoder. Jeg ville trekke opp en annen dimensjon av verdens koloniale historie og nyansene i det menneskelige segmentet. Igjen drar jeg parallellen til Pile o´bones, den blodige bøffelmassakren som var en bevisst strategi for å drive urbefolkningen bort fra sitt levesett og sitt land. Det handler om hvordan makteliten uforskammet skor seg på tragedier for de som ikke besitter majoritetens eller kapitalens makt. At jeg lagde porselen av beinrestene fra mine reinhoder, er en referanse til hvordan beinrestene av døde bøfler ble sendt til Europa for å bli omskapt til det eksklusive bein-porselenet (bone-china). Det er en vond smak i det at man først massakrerte bøfler og urbefolkningens levesett og kultur- for deretter å smykke seg med tragedien ved varer som ekslusivt er forbeholdt makteliten. 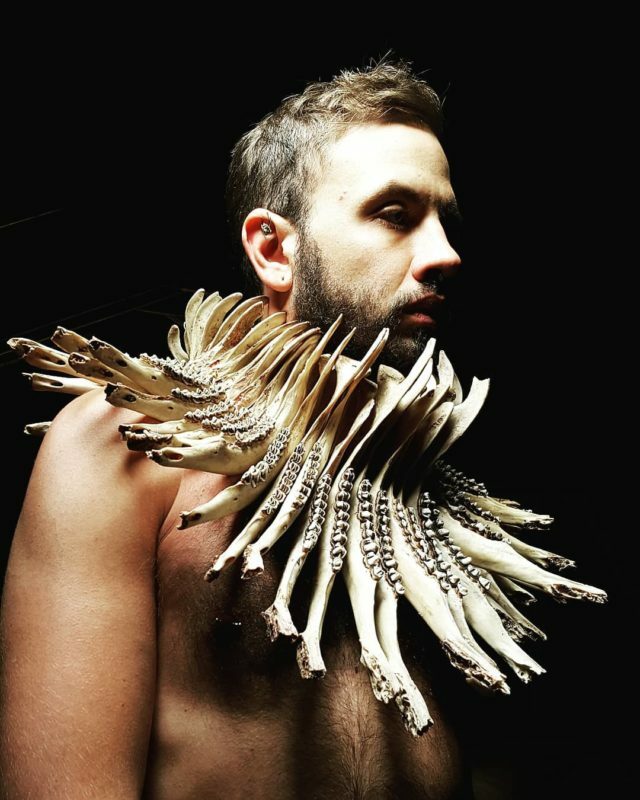 Det verket som jeg lagde til Documenta 14 kalte jeg for “Pile O´Sápmi Power Necklace”. Det handler om hvordan man bærer makt visuelt ved maktsymboler og ofte overdådig eller vulgær estetikk. Samtidig handler det for meg om å eie sin historie og ta makt over tragedien som utspiller seg med et potensiale til å endre utfallet. Det var en impuls at jeg lagde det smykket til Documenta 14, men deretter tenker jeg mye på det min kollega Matt Lambert påpekte, at jeg kanskje ubevisst har jobbet mye i dette segmentet allerede med tanke på materialer, relasjonen mellom materialet og mennesket/subjektet. Dette har alltid stått veldig sentralt i mine arbeider så smykker, eller kunst i direkte relasjon med kroppen, føles veldig nært og veldig naturlig. det er spennende å se hva som skjer med verk, materialer og diskurs, når det leses i dirkete relasjon med kroppen og bæres direkte av mennesker, sier Sara. Pile o Sápmi, aksjoner og hvordan du kan støtte saken! Staten viser ingen nåde, hverken for Jovsset Ante, reinen hans eller for FN´s menneskerettighetsarbeid. For nøyaktig ett år siden satt den unge reindriftsutøveren i høyesterett å kjempet sin sak, der flertaller av dommere dømte han til å slakte ned livsgrunnlag og tradisjonelt levesett. Jovsset Ánte har fått beskjed om at staten tvangsslakter flokken hans dersom han ikke frivillig har redusert flokken til 75 rein innen 31.12.2018. Saken har vekt enormt engasjement blant kunstnere og befolkning. Derfor har DD i dette blogginnlegget samlet linker til arrangementer, underskriftskampanjer og andre arenaer som gir deg mulighet til å reagere og agere. Store søsteren til Jovsset Ánte, Máret Ánne, er en av Dáiddadállus grunnleggere og kunsteren (óg hovedmotoren) bak Pile O´ Sápmi. Máret Ánne startet Pile o Sápmi kunstprosjektet for å synligggjøre og skape kritisk debatt rundt omstendighetene til lillebrorens sak. Reinhodene og rettssaken startet i Indre Finnmark tingrett, hvorav kunstverket iløpet av årene har utviklet seg til en kunstbevegelse parallelt med Jovsset Antes rettssaker. Pile o Sápmi finner du på facebook som en side du kan like og følge. Dette anbefaler vi på det sterkeste for å holde følge på saken og arrangementer knyttet til denne kampen. Bilde hentet fra Natur og Ungdom sin side. Imorgen arrangeres det støttemarkeringer både i Oslo og i Romsa. Under finner du facebook linken til disse arrangementene og der igjen finner du tidspunkt og mer informasjon. Bli med hvis du befinner deg i nærheten! Er du ikke i nærheten av verken Oslo eller Romsa så begynner kunstneraksjonen imorgen som du kan bidra til hvor enn du befinner deg! 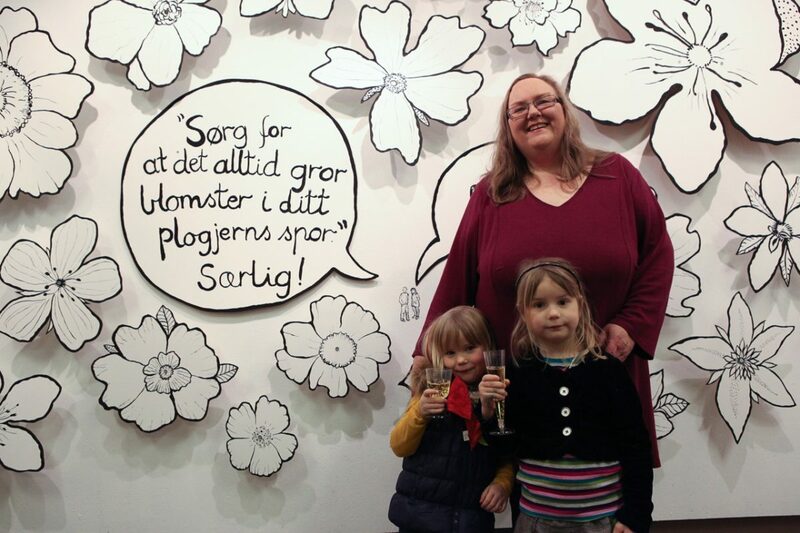 Kunstneraksjonen er en “julekalender” som begynner 24 dager før 31.12.2018. Du kan også signere underskriftskampanjen som allerede har nådd over 3000 underskrifter men med mål om mange flere! Til slutt hjelper det å dele linker, kampanjer og aksjoner med naboer, kollegaer, kjente og kjære! Det burde ikke være en realitet å bruke 20-årene sine på å kjempe mot demokratiet Norge. Dáiddadállu støtter fullt og helt Jovsset Ante i denne kampen og heier på stålkvinnen vår Máret Ánne! Filbmejeaddji ja filbmabuvttadeaddji Ken Are, ja dál maiddái beassášfestiválajođiheaddji! Ken Are beroštupmi filmmaide álggii juo nuoraidskuvllas 90-logus, dalle go Guovdageainnu suohkanis lei mediaskuvla. Son lea gazzan oahpu Kabelvågas Nordlándda dáidda- ja filbmaskuvllas, ja lea 2006’as buvttadan ja rešisevren iežas vuosttas oanehis-dánsun-filmma ovttas Elle Sofe Henriksenin, “Biegga Savkala Duoddariid duohken lea Soames/Vinden visker det er noen bakom viddene”. Son lea maid olu ovttasbargan earáiguin Dáiddadálus nugo Elle Márjá Eirain, Maret Anne Sarain, Ánna-Katri Helanderin, Mai-Lis Eirain, Anne Meretin, Lisa Kristensenin, Per Josef Idivuomain, Inga Márjá Sarriin, Sussanne Hættain ja Sarakka Gaupain. Son lea aitto álgán festiválajođiheaddjin Sámi beassášfestiválii dáppe Guovdageainnus ja beassážiidda jođiha vuosttaš márkaniid ovttas festivála buvttadeddjiin Ol Johan Gaupain. Dáiddadállu illuda boahtte jagáš beassášfestiválii, dat šaddá jalla buorre! Filmfotograf og filmprodusenten Ken Are, og nå påskefestivalleder! Ken Are sin interesse for film startet allerede på ungdomsskolen på 90-tallet, når Guovdageaidnu kommune hadde mediaskole. Han utdannet seg på Nordland Kunst- og Filmskole i Kabelvåg og i 2006 produserte og regisserte han, sammen med Elle Sofe Henriksen, sin første kortdansefilm “Biegga Savkala Duoddariid duohken lea Soames/Vinden visker det er noen bakom viddene”. Han har også hatt tett samarbeid med de fleste i Dáiddadállu: Elle Márjá Eira, Maret Anne Sara, Ánna-Katri Helander, Mai-Lis Eira, Anne Merete, Lisa Kristensen, Per Josef Idivuoma, Inga Márjá Sarre, Sussanne Hætta og Sarakka Gaup. Han har nylig begynt på jobben som festivalsjef for Samisk Påskefestival her i Guovdageaidnu og skal nå lede sin første festival sammen med produsenten Ol Johan Gaup. Dáiddadállu gleder seg til neste års påskefestival, det blir kanon bra! Dáiddadálohas Imagine Native filbma festiválii!/ Dáiddadállus filmskaper til Imagine Native Film + Art Festival! Filbmadahkki ja resiševra Per Josef Idivuoma lea fargga dolleme Torontoi, Candai, riikkaidgaskasaš eamiálbmot filbmafestiválii “imagineNATIVE Film + Media Arts Festival”. Lea 19. jahki go festivála lágiduvvo ja dán jagi lea ge erenoamáš viiddis prográmma. Imagine Native bistá 5 beaivvi ja 150 dokumentára, musihkkavideo, oanehis ja guhkes filmmá galget čájehuvvot dan viđá beaivvis. 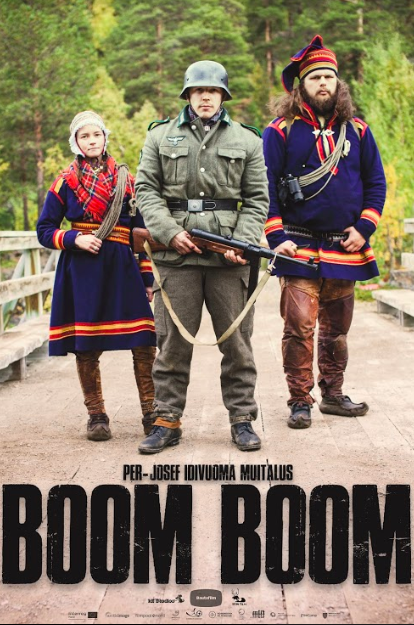 Sámis vulget dát njeallje filmma; Lada Suomenrinne “Árbi”, Nika Rasmusa “Gobmemáinnas”, Sara Margrethe Oskala “Beaivvi nieida” ja min miellahto guoktá Per Josefa ja Ken Are “Boom Boom” oanehis filbma. Per Josefa “Boom Boom” oanehis filmma vuođđun lea guovtti sápmelačča rolla 2. máilmmisoađi áigge Davvi-Ruoŧas Norgga rájás. Guođoheaddji guovttos sorroba várálaš válddástallamii duiskalaččaid vuostá. Sudno plána ii mana ge áibbas nu go galggai go fuobmába ahte áššit eai lean ge nugo doaivvuiga. Ken Are Bongo guhte lea leamaš mielde filbmemen “Boom Boom” oanehis filmma lea maiddái leamaš mielde buvttadeamen Ara Marumaru(The Shadow) oanehis filmma. Ara Marumaru buvttaduvvui Maoriland Filbmafestivála áigge “The Third Native Slam” oktavuođas. 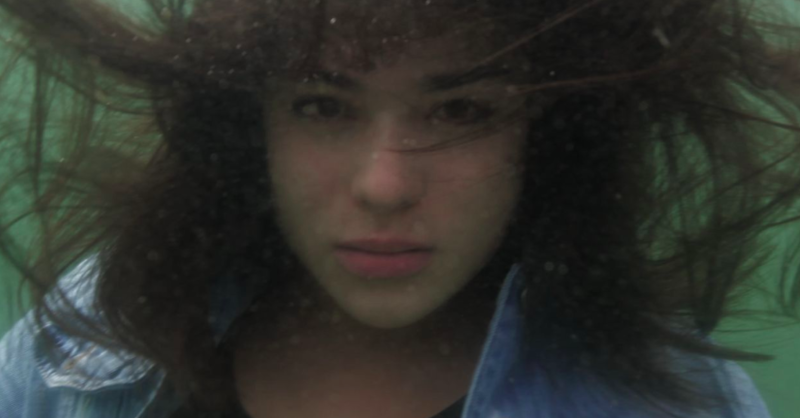 The Third Native Slam lea gilvu mas lea ulbmilin čohkket golbma filbmadahkki iešguđetge eamiálbmot čearddas ja hástalit sin ráhkadit oanehis filmma 72 diimmus. Dáiddadállus filmskaper og regissøren Per Josef Idivuoma er straks på vei til Toronto, Canada, for å delta på den globale urfolks filmfestivalen “Imagine Native” film + media arts festival 2018. Festivalen arrangeres for 19.gang og har aldri hatt så stor program før. Festivalen varer i 5 dager og har hele 150 visninger på dokumentarer, musikkvideoer, korte og lang filmer laget av urfolk verden over. Sápmi representeres med 4 visninger; Árbi av Lada Suomenrinne(FI), Gobmemáinnas av Nika Rasmus(FI), Solas Datter av Sara Margrethe Oskal(NO), og våre medlemmer Per Josef (Regissør) og Ken Are(Filmfotograf) med filmen Boom Boom. Per Josef`s kortfilm “Boom Boom” er basert på sann historie om samenes rolle under 2. Verdenskrig i nord Sverige på grensen til Norge. I kortfilmen møter vi 2 samiske reingjetere som involveres i et farlig kupp mot tyskerne. Deres mission går i stå når de oppdager at ting ikke er som man tror de er. Ken Are Bongo som i tillegg til å være filmfotografen i kortfilmen Boom Boom har også vært med i produksjonen av kortfilmen Ara Marumaru(The Shadow). Ara Marumaru ble lagd under årets Maoriland Filmfestival i New Zealand i sammenheng med ”The third Native Slam”, en konkuranse som går ut på å sette sammen 3 filmskapere fra ulike urfolksbagrunn til å lage en kortfilm på kun 72 timer. Hilde Skancke Pedersen er ny medlem i Dáiddadállu! Hilde Skancke Pedersen har base i Kautokeino, og arbeider som visuell kunstner, kurator, scenograf og forfatter. Hun er best kjent for sine kunstverk til Sametingets plenumssal og foajé, og har fått oppført dramatiske verk på flere teatre i Norge. Hun har arbeidet med scenografi og kostymer for scene, fjernsyn og film gjennom flere tiår. Hennes virke preges av interessen for interdisiplinære prosjekter og samarbeid med andre aktører fra ulike kunstgrener. Idag jobber hun blant mange engasjementer og verv frem mot separatutstilling på Sámi Dáiddaguovddaš i 2020. Dáiddadállu ser frem til å ha sprudlende og kreative Hilde med i kollektivet!